X3 Racer downloads in .pdf format. Right click and save on your computer or left click to open. About the award winning X3 Sailing dinghy. The X3 sailing dinghy is a 3.1M dinghy with a polyethylene hull and foam core that has won an Australian Boat of the Year category and also the Best Rotational Moulded Product in Australasia award. The X3 sailing dinghy is very stable, and the plastic hull and parts mean low maintenance and durability. Quick to rig, there are several rig and sail options to upgrade the boat so that clubs and schools can cover a wide range of ages, weights, skill levels and sailing conditions when teaching their members. In Australia, clubs commonly put 2 to 3 children or teenagers in each X3 when teaching the kids. The coach often also sails with a child in the boat with him or her. The X3 Resort has a 4.6sqm furling Dacron mainsail and a 5 meter long composite Carbon mast (that breaks down into 3 pieces for easy transport). The X3 Resort mainsail has less roach than the other X3 options, and is intended for use by people who have little or no knowledge of how to sail. eg. Absolute beginners at resorts or sailing schools. The X3 Resort package is an ideal option for sail -training establishments that deal with schools or public self-hire. It is tailored exclusively for customers that have a limited time to learn how to sail, and that have no sailing experience. The mainsail is a 4.6sqm full radial sail made with highly visible mylar sail fabric. It can also be reefed for stronger winds and beginners. Storing the rig is easy as the mainsail can be wrapped around the mast. The X3 Resort rig can be upgraded with a jib package. This sail/rig option is suitable for one adult and child, or one to two children. To upgrade to a gennaker package, an X3 Education or X3 Fun rig conversion (including another boom) and the appropriate mainsail package will have to be purchased. The X3 Education package has been developed for entry-level racing. It is tailored to people that have the time and desire to learn to sail competently, and/or that would like to start racing. The X3 Education sail has more sail area in the roach than the X3 Resort, and it has a 4M internally reinforced alloy mast. The X3 Education mainsail is a 4.5sqm fully-battened high roached sail with clear mylar ultra-durable fabric incorporating the new easy-tack batten system (battens are removable). The Education sail package is upgradeable with the jib or Education Gennaker package. The Education sail/rig option is suitable for one adult or one to three children. (depending on their size). The X3 Fun has been developed to allow people to progress onto a more advanced sailing level from the X3 Education or X3 Resort. It is tailored exclusively for intermediate to experienced sailors. This 5M internally reinforced alloy mast option offers faster, more exciting sailing. The X3 Fun has a 6.3sqm fully battened high roached sail with clear mylar ultra-durable fabric incorporating the new easy-tack batten system (battens are removable). The sail combination can be upgraded with a training jib, fractional Education gennaker or the masthead Fun gennaker. This option would be suitable for an adult and child or minimum of 70Kg body weight. It is possible to purchase a Resort, Education or Fun rig conversion so that you can have different rigs for the same hull, and in this way have the versatility I mentioned earlier. If a Resort rig is purchased with another type of rig conversion, a different boom will also need to be purchased for the other types of rigs as the Resort rig has a different outhaul system to allow the sail to furl. The colour of the hull is white with a fleck. The Education and Fun mainsails are made with clear reinforced mylar. The Resort mainsails and jibs are made of clear reinforced mylar with coloured Dacron trim on the leech, luff and foot. The colours are either pink or orange dacron. The gennakers are made out of bright yellow nylon material. The X3 Boat bag is now supplied as part of our packaging costs with all X3 ‘s Shipped Nationwide and Internationally. Custom made with two layers of durable Polyweave sandwiched with 10mm of closed cell foam, has a Zip around the outside, and an internal built-in pocket for sail, boom and rudder storage. Many clubs and schools have chosen the X3 sailing dinghy as their sail training solution, and have proven the X3’s reliability, ease of use and fun for their students. The concept of the X3 sailing dinghy is to make sailing more exciting and fun for all by having sail combinations totally interchangeable, (from novice to experienced skill levels). Introducing gennakers (asymmetric spinnaker) to students at an early stage, has the great effect of teaching unique skills for the future while at the same time making their experience more fun and exciting. What does world-renowned America’s Cup skipper John Bertrand think of the X3 RACER after putting it to the test? Ryan Welguz – Sailing Instructor, Canada and Australia. 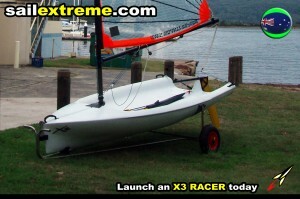 X3 Racer-daysailer. If I had two youngsters interested in learning how to sail, I’d be looking hard at this X3. This little boat comes from Australia and has been specifically designed to use a graduated system for introducing sailors to the various complexities of the modern racing dinghy. This is another rotomolded craft. Not only that, it’s made from recyclable materials. Aesthetically this boat has the earmarks of a racing dinghy. The stem is almost plumb, and the transom is open. The hull form shows a sharp entry fairing quickly into the topsides to provide plenty of buoyancy. The sections at the stern are a flattened arc for good planing performance. The transom is open for drainage. The centerboard is a deep high-aspect-ratio board that should give this dinghy excellent performance on the wind. The rudder is a kick-up type for beaching. The deck is cambered with a large radius on the inboard edge to make hiking comfortable. Here’s how it works. First you buy the basic hull platform and the “education” sailplan. This is a short cat rig with a fathead-type full-roach main. This is going to look pretty high-tech to your kid compared to the Walker Bay rig, and once your youngster has mastered the main he can graduate to the small asymmetrical chute for better downwind speed. Now your kid’s beginning to feel like 49er champion Jonathan McKee. Still, there is really no need to rush the chute, since you can have lots of fun with the single sail. It’s only 43 square feet, and the gennaker adds another 48 square feet, doubling the horsepower. With a main, gennaker and a 110-pound crew, the sa/d is 38.8. You can also sail the X3 comfortably with two youngsters. So, after a summer of learning with the education rig your kid can spend the winter bulking up and getting ready for the “fun” rig. This rig adds an additional 19 square feet to the mainsail for a total main area of 62 square feet. The gennaker is also substantially larger with a sail area of 88 square feet. With the bigger rig the downwind sa/d is raised to 58.8, assuming your kid has put on 30 pounds over the winter. To achieve this I recommend Bob’s famous Swiss steak recipe with lots of mashed potatoes smothered in Bob’s Swiss steak sauce. The X3 with the fun rig is now elevated to true high-performance dinghy numbers and should satisfy the most demanding dinghy sailor. Yes, you will capsize this dinghy. You should. I don’t think you can learn to ski without falling, and I don’t think you can learn dinghy sailing without capsizing. Most kids like to capsize, especially on hot days. However, with the short rig this will be a rarity. Really you should instruct your learner in the tricks for righting the dinghy anyway to complete the education process. Clearly this is a boat I could enjoy. A performance dinghy with multiple rigs for all abilities. Australian Navy Cadets X3 sailing dinghy reference. “The 4th Williamstown Sea Scouts have been using 6 X3 dinghies over the past 2 years. During that time the craft have proven to be functional, rugged and easy to maintain. The configuration is suitable for introducing young Scouts to sailing and allows them to progress in the same craft to a more demanding sail configuration using the asymmetric spinnaker. The self-draining design has seen as many as three scouts per boat at times, but two up and solo is more the norm. I have no hesitation in recommending these craft for training programs. The lack of standing rigging is useful for a quick start and quick pack up and means more time on the water”. 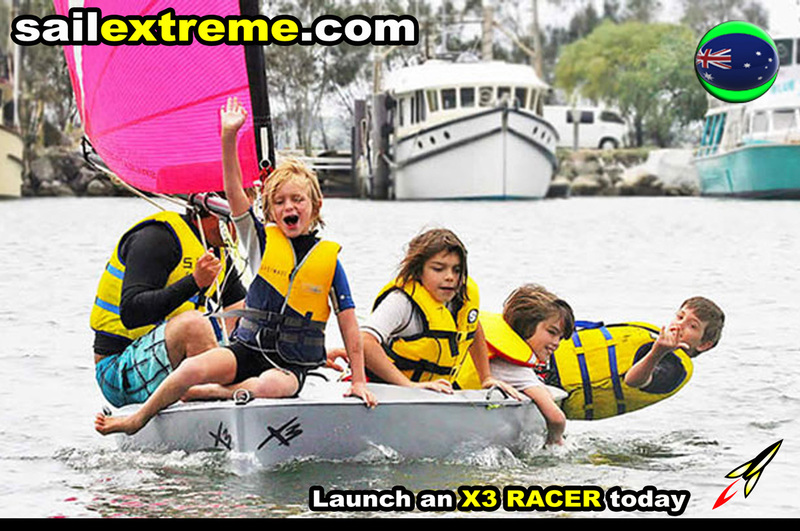 For further information on the X3 and a quotation for your club or school contact one of the X3 team at Sail Extreme. 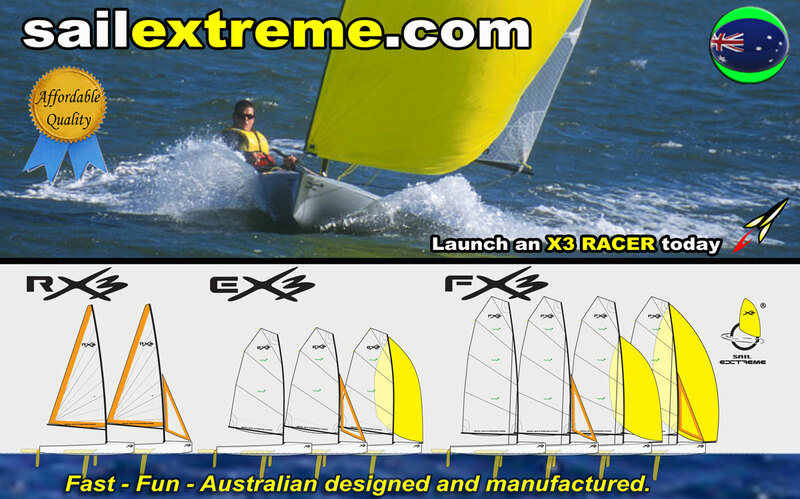 Sail Extreme Pty Ltd is located in Manly,Brisbane Queensland, Australia. 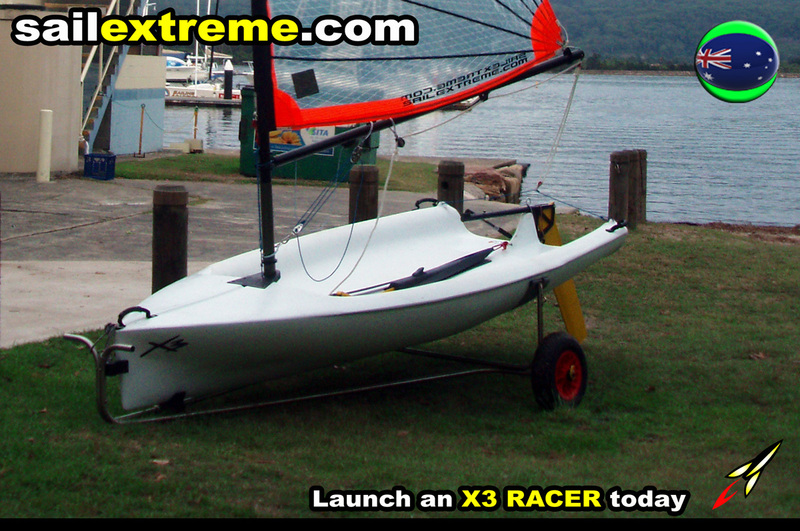 The X3 Racer was originally designed in 1999 by Jim Close of Sail Extreme Pty Ltd. We have also been manufacturing the X3 racer for the past 19 years in Australia. 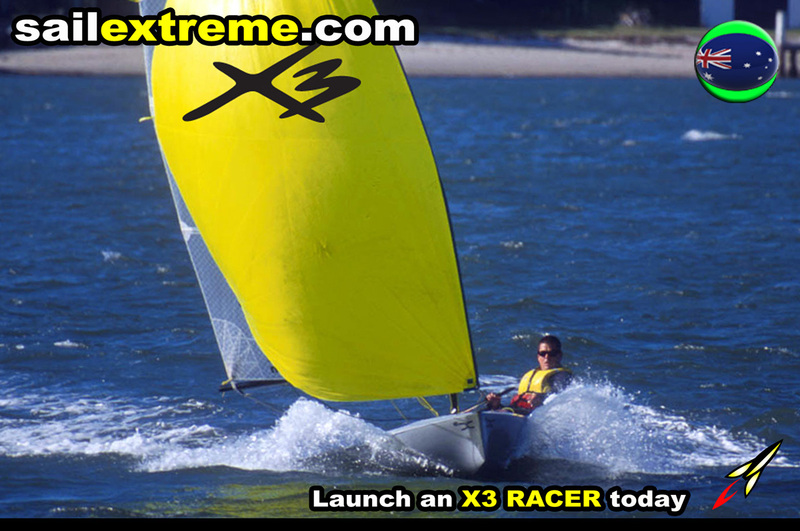 The team at Sail Extreme hopes to see you out on the water sometime having fun.